As residents can attest to, Juneau County has some of the most diverse and appealing scenery in the country, from the hills to the forests, the bluffs and the waterways. Each corner of the county has something special to offer. With the expansion of ATV routes, visitors can exit at any of the four Juneau County I90/94 exits, eat and stay locally, and hop on their vehicles to explore the area. You can find these maps at most business establishments located in and about an ATV/UTV route - it is not available on the Internet. If you are unfamiliar with the area and would like to pick up a map, contact a local club. The cost is only $2.00 if you pick it up, $5.00 to have one mailed. 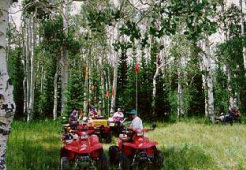 JCAC, formed in 2011, was established to have all Juneau County ATV Clubs work together in planning and promoting safe, lawful, ATV recreational riding. By working together, JCAC becomes one voice representing many organizations. JCAC works closely with local municipalities in connecting routes across the county and with the Juneau County Highway Committee should there be a need to access County highways. The Council consists of two members from each ATV club that wishes to participate and two members at large. City and Township ATV Ordinances Disclaimer....Please check with the townships to see if they have any additional ordinances prior to ATV use. For township contact information, click here. Before hitting the routes & trails, know the laws! The information provided in the below pamphlet is effective as of July 1, 2012.